Seymour Duncan Vapor Trail Review – Best Analog Delay Pedal? Seymour Duncan has been long regarded among pro guitarists as one of the leading names in guitar pickups. And back when Seymour Duncan made their first foray into guitar pedals with the now iconic Seymour Duncan SFX-01 Pickup Booster, it became immediately clear that they know a thing or two about pedals, also. After a series of successful pedal releases, it’s actually been a few years since Seymour Duncan has released something new. But they sure weren’t resting on their laurels as their brand new Vapor Trail Analog Delay shows. The Vapor Trail clearly shows just from its spec sheet that the folks over at Seymour Duncan have been doing their homework. This is a pedal for guitar players interested in warm sounding, authentic analog delay tone who don’t need tap tempo. Therefore it will conveniently fit into a standard-sized stompbox slot on your pedalboard. And it hits that perfect street price point of around $149. The Vapor Trail also packs a few extra features that give this pedal some distinct advantages over the competition. It has modulation as expected, but both its modulation Rate and Depth controls are on the surface, easily tweakable in live situations. There’s also an effects send/return, perfect for coloring the delay with other pedals, using the delay in stereo, or controlling the Mix (delay level) with a volume pedal. A transparent Delay knob with a flashing blue LED light also gives you realtime feedback of the delay time. This just might be the most exciting pedal Seymour Duncan have released. If it sounds as good as it looks, the Vapor Trail could be a hit. Is it the best analog delay pedal in this price range? You’ll find out in our Seymour Duncan Vapor Trail review. All analog Bucket Brigade (BBD) delay signal path supported by modern low-noise analog electronics. No microprocessors or digital signal processors. Delay control knob adjusts delay time from 15ms to 600ms. Actual delay time indicated by flash rate of illuminated Delay time knob. Repeats control knob sets delay feedback from one repeat to runaway repeats and self-oscillation. Mix control knob blends wet and dry signals. Wet signal is adjustable from muted to +3dB. At the highest settings, the first echo is actually louder than the dry signal. Rate control knob adjusts the rate of modulation from 0.2Hz to 4Hz. Depth control knob adjusts modulation depth from zero to “over the top”. TRS wet channel insert loop allows external effects to be applied to only the wet signal. Also serves as wet-only output for wet/dry stereo or studio use. Powered by 9-volt battery or 9-18VDC power supply. Visit Seymour Duncan for more info about the Vapor Trail Analog Delay. There’s nothing quite like the sound of a great analog delay pedal. 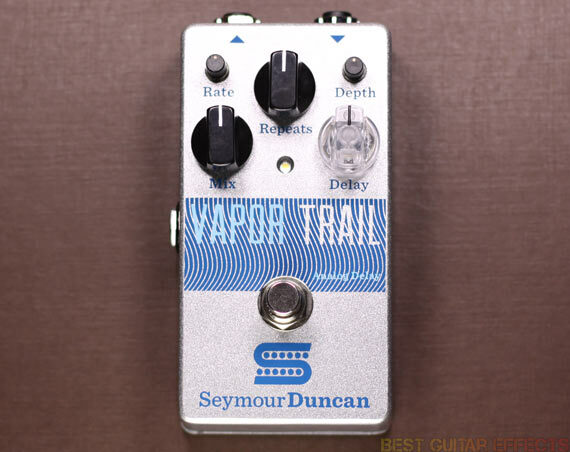 One of the first things I noticed about the Vapor Trail is that Seymour Duncan really put in some time to get the tone right. Just by setting the Mix, Repeats, and Delay to around noon and kicking on the pedal, a gloriously warm analog delay replicates your playing with that characteristic high-end rolloff that darkens more as the repeats fade out. Taking those 3 knobs up in the 1-2 o’clock vicinity adds a little more of everything, bringing that warm delay up in the mix with more feedback repeats and longer delay times. 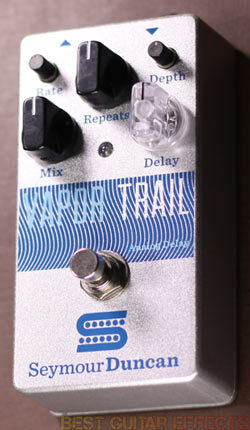 The Vapor Trail produces a wide range of classic delay sounds. Cutting back the Repeats and Delay to around 9 o’clock produces a vintage style slap back delay. Cutting the delay time even shorter and bringing up the Rate and Depth knobs lets you achieve all kinds of modulation ranging from gentle chorusing to rotating speaker-like effects. Pushing up the Vapor Trail’s Delay knob to around 2 o’clock lets you pull off those longer delay times that are good for some Edge style rhythmic delay tones. Again, tone is one of the paramount features of a great analog delay pedal. One of the biggest drawbacks of some classic old-school analog delay pedals is, of course, the noise often inherent in those outdated electronics. Seymour Duncan have made great effort to use high quality modern components that create a lush analog delay sound that isn’t diminished by noise in the signal. The Vapor Trail retains warmth and clarity without any annoying hiss. If you do appreciate a little graininess in your repeats, you can get a little bit of that lo-fi sound with heavy delay layering on a high feedback setting via the Repeats knob. And there’s always taking it over the edge to sonic insanity by cranking the Repeats for some wild self-oscillation. If you want even more ways to color the tone of your delays, the Vapor Trail’s TRS send and return jack is the way to go. You can patch in any pedal (or pedals) to affect the delay signal only. I found great results using various overdrives and pedals with versatile EQ sections to saturate and color the tone. If you have a favorite modulation pedal, you could even use it to modulate the delay instead of using the Vapor Trail’s onboard modulation. But the Vapor Trail’s modulation actually sounds quite nice, and you can even use it in conjunction with the effects loop to modulate the processed delay signal. I’ve been having a lot of fun getting a grainy distorted sound and modulating it with the Vapor Trail set to maximum Depth and minimum Rate for some broken tape machine effects. There’s a lot of sounds to be achieved by throwing your favorite pedals in the loop and seeing what you can come up with. The Vapor Trail’s delay time indicator LED in the Delay knob is nice touch and gives you handy visual feedback in a live situation. It’s another one of the subtle little features that shows the folks at Seymour Duncan really thought this pedal through in terms of features. Some guitarists don’t need tap tempo but will appreciate having this little visual indicator of where your delay is set before kicking on the pedal. Quite frankly, the Vapor Trail is so good that there just really isn’t much to complain about. If I had to nitpick, I’d suggest moving the footswitch closer to the end of the pedal for easier access with less possibility of hitting the knobs with your foot onstage. There’s certainly room inside the pedal to switch the battery compartment and footswitch positions. But that minor criticism pales in light of just how good this pedal sounds. Before you drop your hard-earned money on a comparably priced analog delay pedal, you need to try the Vapor Trail. You’ll be glad you did. The Seymour Duncan Vapor Trail has essentially upped the ante among affordable, space efficient, and quality sounding analog delay pedals. With this and their fantastic 805 Overdrive, I predict Seymour Duncan is going to keep making waves in the pedal game. Let’s see the final result. The Seymour Duncan Vapor Trail has set a new standard for an affordable, high-quality analog delay pedal. The Vapor Trail sounds pristine and warm, with a beautiful vintage-inspired tone. Thanks to Seymour Duncan’s use of quality components, the Vapor Trail sounds remarkably clear, free of the background noise and hiss suffered by many old-school analog delay pedals. The modulation (with convenient surface controls), TRS send and return jack, and handy LED delay indicator further stand to set this pedal apart from the crowd. 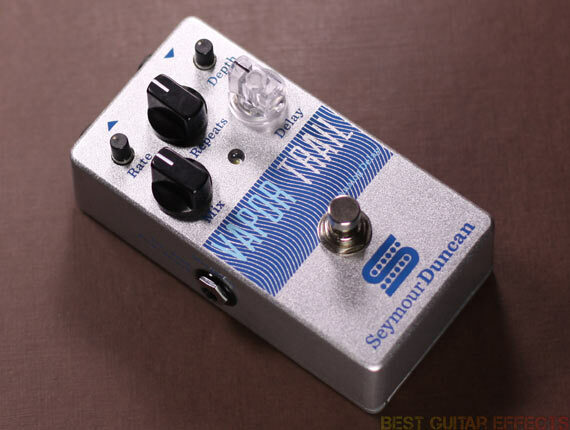 If you’re in the market for the best analog delay pedal that’s affordably priced and has premium tone, definitely audition the Seymour Duncan Vapor Trail. That concludes our Seymour Duncan Vapor Trail review. Thanks for reading. Want to buy the Seymour Duncan Vapor Trail?